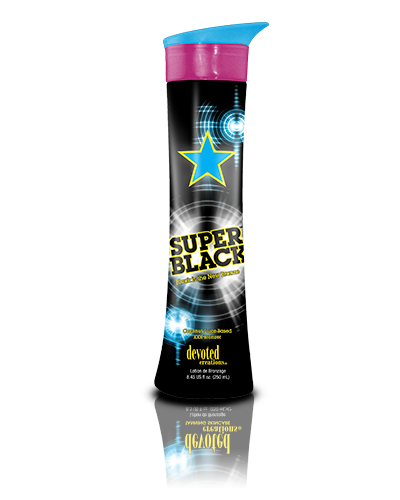 Super Black is an intense DHA bronzer formulated with natural and cosmetic bronzers for immediate and delayed dark bronzing results. It is also blended with camu camu berries to help slow down the aging process. Sea weed and bee’s wax are utilized to help draw toxins from the body and work to condition the skin. You will notice soft, smooth skin, an instant, immediate color as well as a dark long-lasting tan and a fabulous Sparkling Berry Punch fragrance. Extreme immediate and delayed bronzers. Intense DHA formula blended with natural and cosmetic bronzers for immediate and delayed bronzing results.